Hermosa Beach is a small beach town located 4 km south of Jaco on the Pacific Coast of Costa Rica. This town is very popular among surfers and expats that want to live in a quiet area. Several hotels, restaurants, small convenience stores and homes are located beach front which is the center area of Hermosa. In Hermosa you find several communities and neighborhoods with condominiums and houses. One of the neighborhoods in Hermosa is Opera Salvage this secure neighborhood is popular among families and is surrounded by lush forest and mountains. Hermosa Palms is a gated beachfront development on the south area of Hermosa where you find single family homes. In these specific Hermosa communities and in Hermosa in general we have several properties for sale. The beach of Hermosa is a big stretch of black sand and unspoiled beach, perfect for a walk. Hermosa’s main attraction is its waves and is a destination known by surfers all over the world for its consistent, whole year round surf breaks. Thanks to the great waves it is often the place for international and national surf contests. Hermosa’s Beach hotels are very cozy and many are beachfront so you can keep a check on the waves. Hermosa has a couple of small convenient stores, yoga studio and a pre-school and elementary school called Ficus Tree. Hermosa Beach is only a 10 minute drive from Jaco. 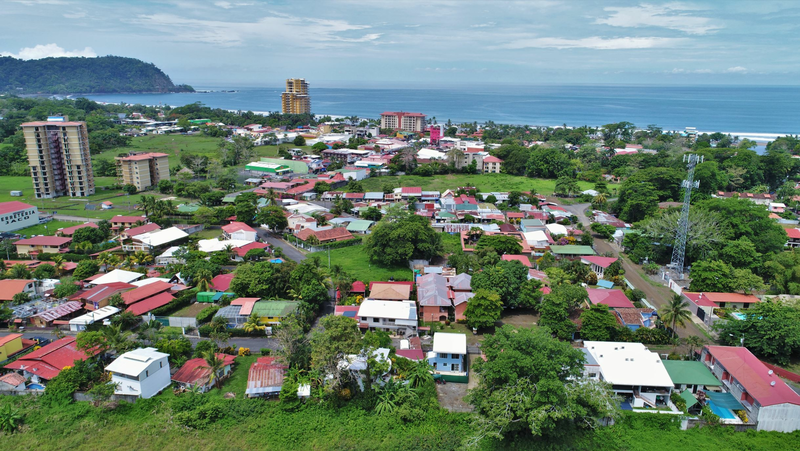 Jaco is a bustling beach town where you find all the amenities you need such as supermarkets, medical services, spas, shops and a movie theater. There are many restaurants in Jaco and plenty of nightlife entertainment such as bars and casinos. There are plenty of activities and tours to do in and around Hermosa such as zip lining, biking, hiking, golfing, sport fishing, horseback riding and of course surfing. The beautiful scenery and its location near Jaco make Hermosa the destination for surfers and beach lovers who like the convenience and enjoy the peace and quiet. If you are looking for more information about Hermosa Beach or for real estate in Costa Rica feel free to contact any of the agents in the REMAX Oceanside office in Jaco.